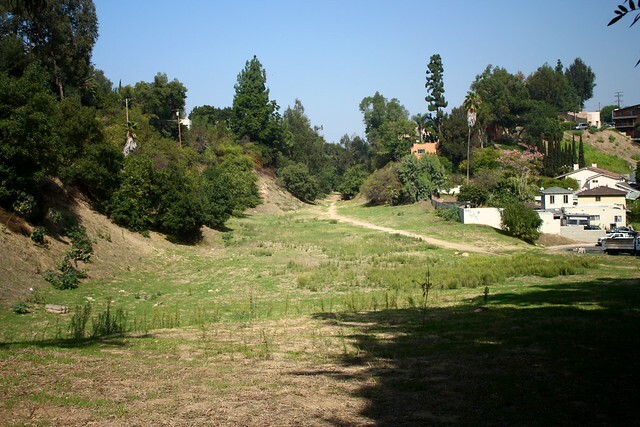 A very short but kind of hidden open tract of land in Echo Park / Silver Lake. Historic Red Line properties and ruins and easy access from those neighborhoods make this a great quick walk or part of a longer urban staircase hike in the area. Maybe if you’re lucky, you’ll see a ghost train? Doing The Big Parade earlier this year kindled a newfound interest in the hidden staircases and old streets of Echo Park and Silver Lake, and after discovering a blog dedicated to a very small but historic tract of unused land in the neighborhood and seeing the trail written up as a potential haunted hike in LA Weekly, I wanted to go check it out for myself. This is not really a hike in the traditional sense – or even in the sense of most other write-ups on this site – but it’s a pretty cool and little known public space that could be worth checking out as part of a quick morning walk or as an add-on to other short trails or staircase walks in the area. The path begins on a very nondescript street corner – where Allesandro Way makes a sharp left hand turn at the intersection of Lake View Avenue. There is a small sidewalk that continues along the canyon running parallel to the Glendale Freeway. 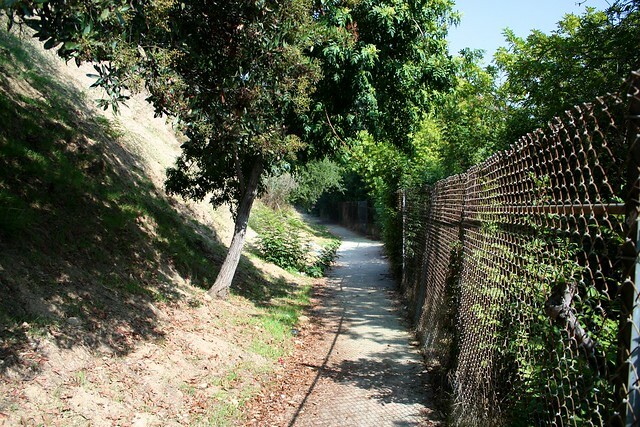 In just under a tenth of a mile, the sidewalk approaches the end of Corralitas Drive, where a small open space reveals the first visible stretch of the old rail line, leading into a wooded canyon. For the next 2/10ths of a mile, the path follows the old Pacific Electric Red Car route to Glendale, which ran from 1896 to 1955. 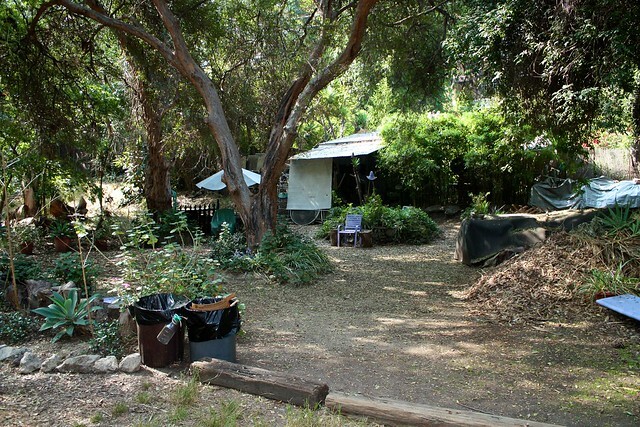 Since then, this land has had a long list of attempted uses – ranging from housing developments to an equestrian path to inclusion in the Santa Monica Mountains National Recreation Area – but so far, no one has been able to do anything with it – so the local residents have taken to using it as an unofficial park. The Pacific Electric Railway circa 1905, looking north to Glendale. Corralitias is the hill to the right. The short, shaded wooded area is actually quite nice – like a hidden mini-park tucked near a series of freeways. Kind of a strange, “only in L.A.” situation. Some of the nearby residents have extended their backyards into the area, creating pocket gardens and peaceful places to relax. Others have written about seeing old rails and tracks here, but I wasn’t able to see anything when I went. Eventually the path opens up again onto an unpaved road. 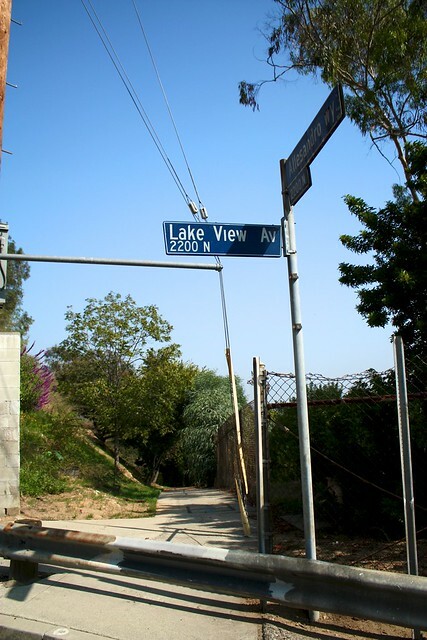 Google Maps calls this road “Silver Lake Court,” but I couldn’t see any street signs confirming that. This again is the old path of the Red Car, and it continues north. 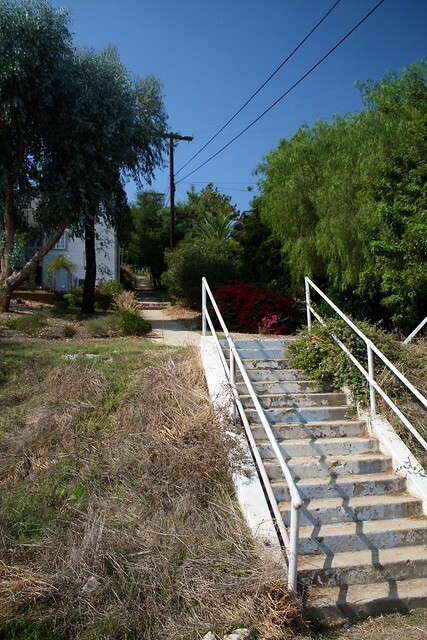 At just past the half-mile mark, you’ll pass a long stairway that locals used to use to get to the trolley line. Continue along this dirt road for another tenth of a mile, when it once again becomes an undeveloped, overgrown green space. Here, I actually did start to see some remnants of the trolley lines along the way – as well as some decent views of Mount Washington across the L.A. River. 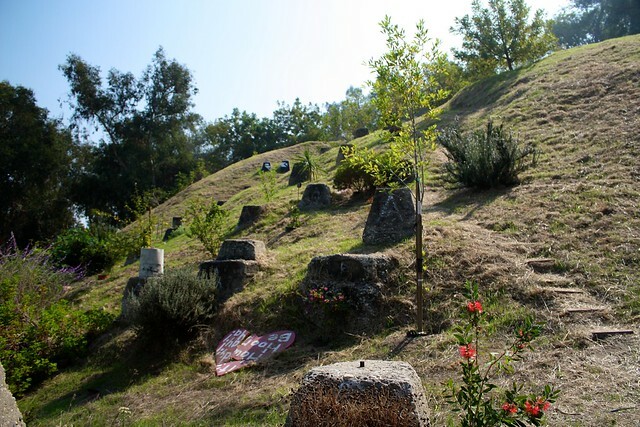 At about the 0.7 mile mark, you’ll come to a steep hill covered with strange cement obelisks, and you’ll see Fletcher Drive cutting through the canyon between the hill you’re on and another hill. 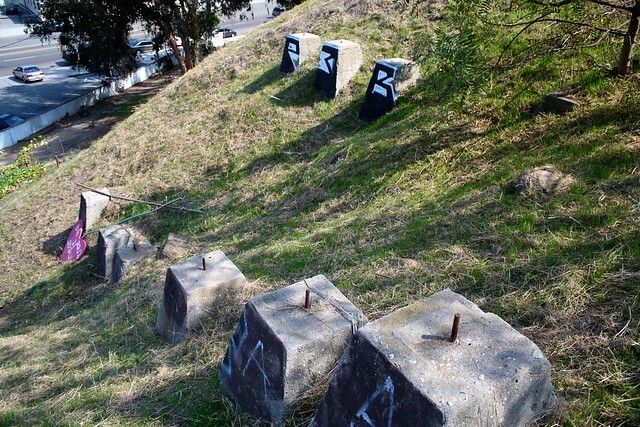 If you’re like me, you’ve often wondered what the heck this area was when you’re driving through it – and now you know. It’s the City of Los Angeles Historic Landmark # 770 – the Pacific Electric Red Car Viaduct Footings. These cement structures are all that’s left of a 100-foot tall trestle bridge that spanned between the two hills. Today, the space is used mostly by the occasional artist – and it seemed there were a few gardens tucked into the space, too. When you’re finished, either return the way you came or try exploring some of the surrounding neighborhood instead – and try to imagine how different the city would be if the Red Car was still operating. Spotty. This route doesn't follow a trail in the traditional sense, but rather an old uninhabited track of the Red Line car to Glendale. 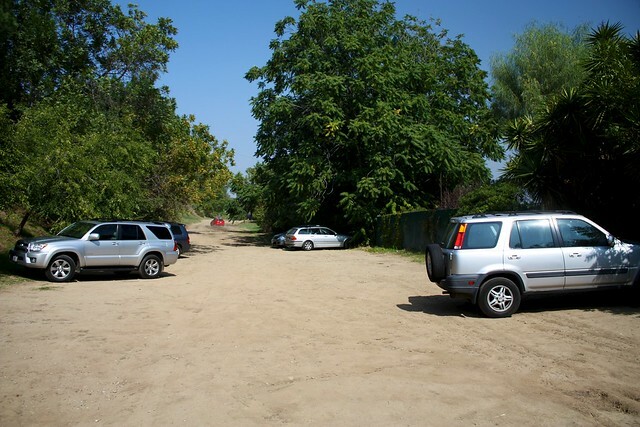 Park at the sharp corner of Allesandro Way and Lake View Avenue just west of the Glendale Freeway. No permits required. Transit accessible via Metro bus 603. Ooh, thanks for the update Tony. This area is in the midst of a mildly contentious land ownership issue right now -- the city was trying to buy it as a park but something fell through and now the owner is looking to develop it again, so that might be the reason you saw some no trespassing signs. I'll see if I hear anything further! I hiked this short trail for the first time today. The side stair-streets up and down were especially fun. The trail is closed off about 2/3 of the way to the steps at Fletcher and Glendale, by fencing that reads "Private Property." Is that permanent? great post, I'll have to check this trail trail out some time soon! I'm with you - "Others have written about seeing old rails and tracks here, but I wasn’t able to see anything when I went." Dead right. 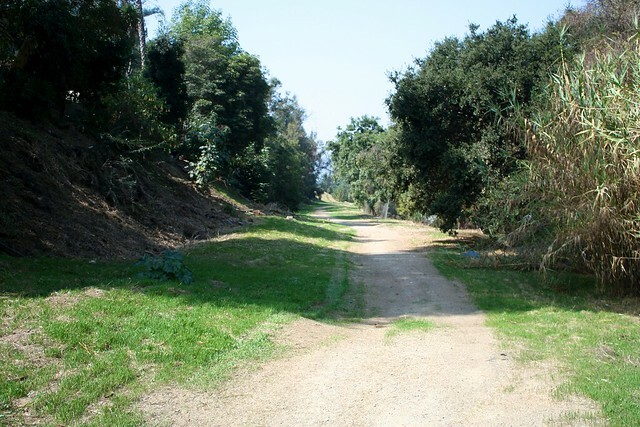 I was there partly because of the LA Weekly write up, which says, "Bordered on both sides by the skeletons of abandoned cars and machinery, the public trail near the old rail is as creepy as it is cool. Relics of the big red cars are still visible." What were they smoking? Still a good, little known corner of LA though. There weren't any there when I went, but you never know. 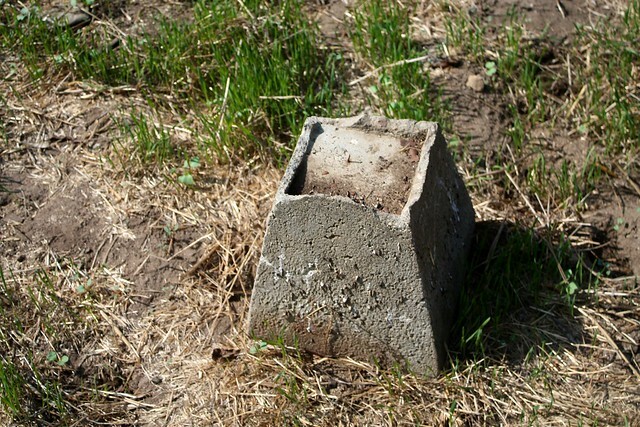 I always wondered what the cement blocks where behind the Arco station at Fletcher and Riverside. Is it safe to walk it? Are there any homeless camps? Very cool post. I didn't know about this trail at all!